Less than a week after Battery Park City residents learned that a private security firm was hired to replace most of the Parks Enforcement Patrol (PEP) officers who police their neighborhood’s 36 acres of parks, residents voiced deep concerns about the move at a three-hour meeting of Community Board 1’s Battery Park City Committee on Monday. But more than the decision itself, authorized at a Battery Park City Authority Board meeting on Oct. 29, they blasted the authority for what they see as “complete disregard for the community’s input,” as committee Chair Anthony Notaro put it. The committee planned to draft a resolution that, in part, would take the authority to task for leaving the community board out of the decision-making process. Unlike the PEPs, private security officers do not have enforcement powers and cannot write parking tickets or issue summonses for quality-of-life infractions such as alcohol consumption in the parks, off-leash dogs, or public disturbances. PEP officers, though not armed with guns, are equipped with batons, pepper spray and handcuffs, none of which will be carried by the new security officers. 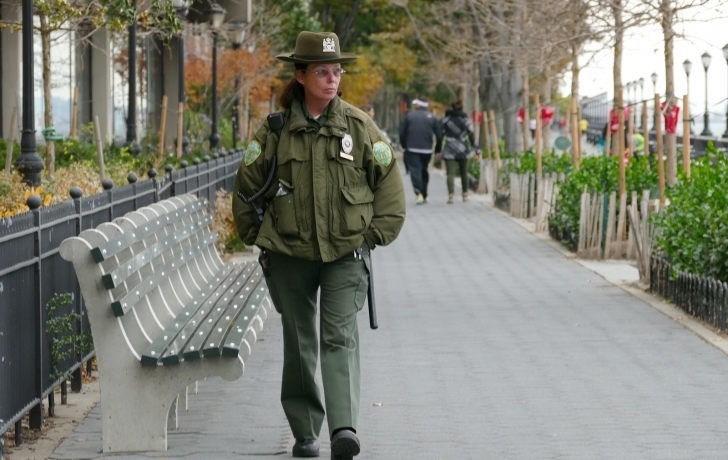 “Most people will not break rules or think about committing a crime if they see a security presence,” said John McCardle, an AlliedBarton district manager who will be in charge of the Battery Park City staff. “Altogether you’re going to have the best security program you can ever imagine,” company executive Kevin Francis insisted. The authority has yet to say why there had been a planned reduction in PEP staff, which frustrated the community board committee. Its resolution, they said, would demand an answer to why the change was made and what studies were conducted to arrive at their decision. Martha Gallo, an authority board member and the board’s only Battery Park City resident, acknowledged that “the process, when it comes to structured community input, needs improvement.” She announced that on Dec. 16, Battery Park City officials will hold the first of a series of quarterly community meetings. “I think we owe it to the community to talk about the things that we are working on and the things we plan to work on,” she said. As for the security contract, which is yet to be signed, “Given all I’ve heard tonight,” she said, “I’m not sure we’re ready to sign it in the next couple of weeks.” AlliedBarton had been expecting to begin patrolling in mid-November, a company representative said following the authority board meeting. Gallo hinted that there had been dissatisfaction with the PEPs who, it was learned at the meeting, the authority had put on a month-to-month contract in March. There is a history of community complaints about an absence of PEPs on patrol and PEPs congregating in groups. But Notaro said that their performance has improved in the past 18 months, when PEP officers began coming to the committee meetings and reporting on recent incidents. Despite anger over the authority’s handling of security changes in the parks, several residents said they liked some of AlliedBarton’s innovative methods. Among them is the use of GPS tracking devices by officers that allow them to record everything they do. “That way we can actually quantify what’s going on and where,” AlliedBarton’s Kevin Francis said, “and present to you and the authority where we would suggest you deploy your resources.” The devices would also allow supervisors to deploy the closest officer in the event that a PEP needed assistance. “We’re good listeners,” Francis replied with a smile. Following is the “summons productivity” of the PEP officers to date this year, as reported by Michael Dockett, the Parks Department’s assistant commissioner for the Urban Park Service, which oversees the PEPs. Submitted by admin on Sat, 11/07/2015 - 1:55am. I'm angry and disappointed about the possible decision to downsize or even eliminate the Park Enforcement Patrol(PEP) in lower Manhattan. Since 2003 they have kept the community safer being a deterrent to crime. They also have been integrated into the Community Emergency Response Team. The Community Emergency Response Team(CERT) is a FEMA program which has certified over 1,000 people for dealing with mass causalities disasters. CERT is made up of resident managers, building personnel, local residents, and Park enforcement personnel. CERT's mission is to help save as many lives as possible during mass causalities disasters. We've seen our share of them. The pep officers are our 24/7 eyes and ears in the community and have the same legal authority as the police without sidearms. To lose them would be a breach in security in a highly targeted area. Our biggest enemy is complacency and it looks like some idiots are complacent about security and have very short memories. Park enforcement personnel should be increased instead of decreased. Those responsible for decreasing personnel by subbing it out to less trained people stand to have blood, terrorism, and crime on there hands. The highest roll of government is to supply the best security possible and the Park Enforcement Personnel fill that need. I would strongly encourage our 1,000 CERT members to show up on December 16th, at the River House Library between 5:00 and 6:00 pm to show their support.